Home > News > Australia Day and India’s Republic Day share the same date. Serendipity or a message from Goddess Lakshmi for Australian businesses to step up? Australia Day and India’s Republic Day share the same date. Serendipity or a message from Goddess Lakshmi for Australian businesses to step up? When Australians think of India they naturally think of the north. Maybe, as playwright David Williamson would have us think, we’re always “travelling north”. I mean, we don’t really have very much that is south of us geographically, pretty much everywhere is north, so perhaps our natural propensity is always to go north. This phenomenon seems to extend to Australian consulting firms, who tend to advise businesses to set up in the north of India – not necessarily because it’s best for the business mind you, but because that’s all the people writing the report know, or worse, because they haven’t got a clue! Sure, the north of India includes all the must see cities and first time tourist delights like Mumbai, Delhi, the palaces of Rajasthan and of course the Taj Mahal in Agra, but does that mean it’s good for your business? I wouldn’t open a Bunnings store in Uluru! So, for the discerning, the south of India beckons. A few years ago, while in India, I received a call completely out of the blue from a fellow Australian business owner who I didn’t know, let’s call him Joe. Joe had just paid for a very expensive India market entry strategy report (and guess what, it had advised him to establish in the north) but he was unconvinced. He asked – is the north really the best place for my business, why did you choose the south and what’s it really like doing business in India? Here’s what I thought: Does this guy have a good sense of humour, the patience of a saint, tenacity, the ability to be flexible and adapt? Will he love India like I do, and will he get that you can’t just ‘set and forget’ your Indian office. And perhaps more importantly, will he come here often enough to nurture and grow his business and build relationships and gain the trust and respect of the Indian business community? Or is he an Australian who will look at a plate of food in India and still think – which one of these things is going to kill me first? Or more naively, are the numbers in his head based on this equation – what I sell x 1.3 billion = happy days. Here’s what I said: Tear up the report. You don’t need to be in the north and it’s actually the wrong place for what you need. As for doing business in India, well (long pause) you will know you’re alive! But if you can succeed here, opportunities you never imagined will open up, not just in India, but globally, because you will suddenly be taken more seriously. The message you will communicate to the business world by being an Australian business with an Indian office is that you think big, have serious expansion plans and your Australian company has global aspirations. Three years later Joe and I regularly reminisce that early conversation and the days we spent together fitting out his office next door to mine in Chetpet, haggling with internet, fridge and microwave vendors for better deals, and we dream of the day when more Australian businesses join us on our Chennai street till it becomes nicknamed “Wallaby Way”. I think that day may be coming, because there is a new momentum on the back of the release last year of the India Economic Strategy to 2035, which identified four of the 10 priority states as being in South India, Tamil Nadu, Karnataka, Telangana and Andhra Pradesh. Yes they are all in the south and for good reason – there is a lot of Australian activity going on down here thanks to a very active Australian Consular office that inspires us to punch above our weight, and it’s paying off. 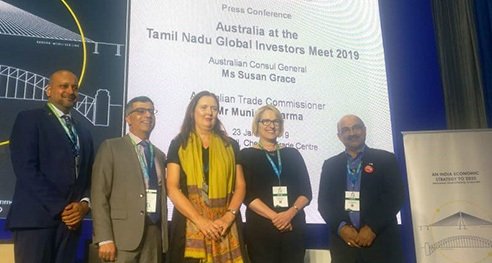 Just in this past week, the Global Investors Meet was held in Chennai and Australia was one of six partner countries with a large delegation of Australian businesses. In the decade I have been doing business in India I have never before seen Australia represented in such diverse fields and in such numbers, whether in the north or south. It was incredibly exciting. Seeing new Aussie faces around the Indian traps is always a buzz and the local media could see it. Every Indian news outlet had our Consul General, Ms Susan Grace and Trade Commissioner Mr Munish Sharma reporting Australia’s ambitious $100 billion investment plans for India and even Synapse got a mention with our plans to expand to a tier II city. In addition, strong advocacy and diplomacy by DFAT and Austrade opened doors for us at the highest levels that we could not have opened ourselves, creating yet more opportunities. It really was a great week for the India / Australia bilateral trade growth story. Xenophobia can be a curse for business. When I look at the modest number of Australian SMEs with a global presence, I wonder why Australian businesses are so reluctant to step outside our shores when we have the smarts, the business culture and the technical infrastructure to succeed in spades. We are all dressed up but won’t come out of the change room to play. In the past decade, the reasons I came to Tamil Nadu have been well rewarded. 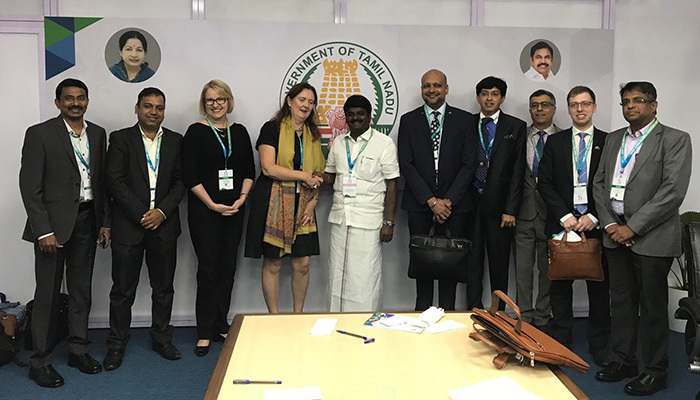 The south of India has a highly educated, English speaking population, comparative peace and stability, good transport links and the local business community has a strong desire to collaborate. So, Australian businesses, it’s time to shake off old views about India that have no basis in reality – nothing on your Indian dinner plate is going to kill you, the food is amazing! India is a market bursting with opportunity and now is the time to do up your boot laces, get out onto the field and make 2019 the year you summon the courage to dip a toe into the biggest market on earth. Of course, all astute business owners will read the India Economic Strategy cover to cover to determine the most appropriate Indian State for their particular business activity, but my totally unbiased opinion is to explore South India…specifically Tamil Nadu…OK Chennai and to be precise, on Wallaby Way. This article first appeared on LinkedIn, you can view the original here.